In this series we are trying to point out things that most people probably wouldn’t think to look at when buying an RV, as well as those things most would. Either way, we hope this series serves to help you in your purchasing decision. 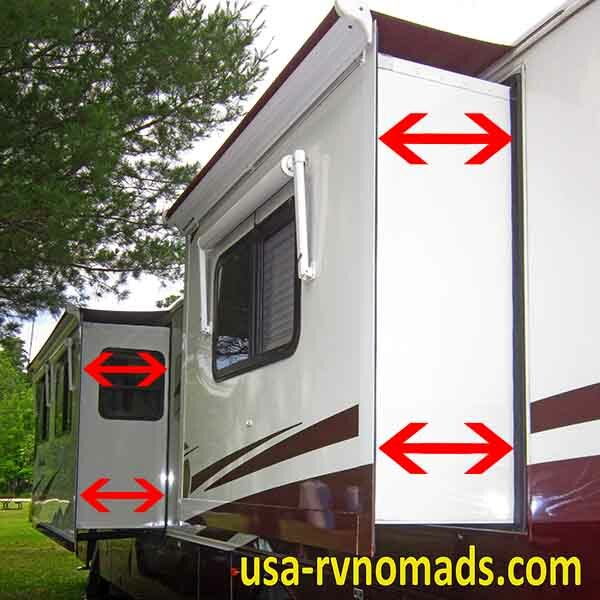 Regardless of whether you are looking at a motorhome, travel trailer or fifth wheel, you need to look for signs that the unit was involved in an accident or was improperly towed or driven. In an earlier post in this series, I mentioned that you need to investigate every corner and crevice of the unit to ensure you’re purchasing something worth buying. Lets start underneath…check the structure, frame rails and visible structure for signs of bending, twisting or corrosion. Don’t be too alarmed if there is some surface rust or corrosion, just as long as it isn’t accompanied by any holes or sections that have been eaten away. If there is any denting, twisting or missing sections, chances are there is other hidden damage above. 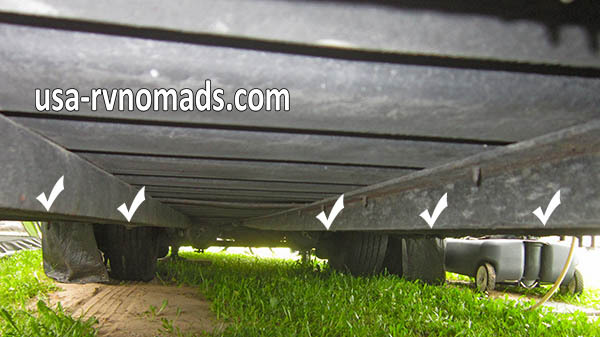 Check the undersides for places where something above may have leaked. Also check for unexplained holes or punctures. Make sure any portals or wiring grommets are intact and tightly sealed to prevent water, rodents and insects from entering through them. 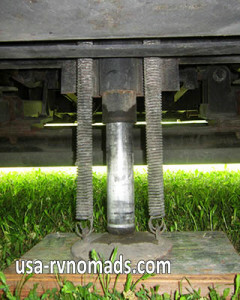 Rigs with underbelly insulation and panels…make sure they are securely fastened to the underbelly. Again look for previous repairs, stains, leaks, wet spots…and any signs of mold. Check the leveling jacks to make sure they are not loose, missing their return springs or leaking fluid. 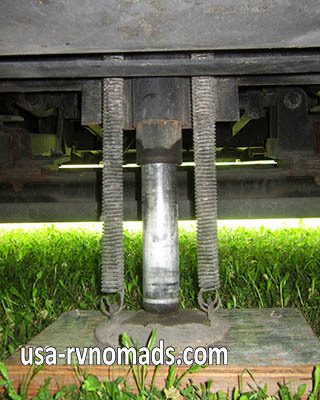 Speaking of springs, these are what retract the jack when the hydraulic pressure is released. If you lose one or more, you may find that they won’t retract the way they are supposed to. Springs will fail due to corrosion, especially at their ends where the hooks are…keeping them clean and free of corrosion is difficult, but worth the effort. This one needs some cleaning and TLC. 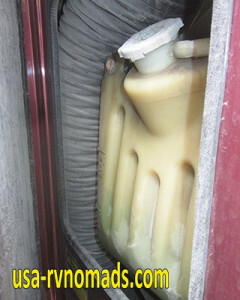 Check the hydraulic hoses and fittings for leakage. If you find leakage, note it on your inspection report…have this repaired before you need to use them. Let’s dust ourselves off and take a look at something we can view standing up. Slides. These things are amazing at providing greater living space inside while parked. Slides are mechanical and can have issues that you may not see or can’t see because of the way they are designed. You probably won’t know of a problem until you have one. Typical problems include not opening or closing properly or completely. One of the first visual clues there is a problem is if they don’t open up squarely. That is, the top doesn’t extend as far as the bottom or vice versa. If the slide is leaning, it may be that it’s out of adjustment, or the drive mechanism and/or rails are not properly installed or failing. The best thing you can do as a potential buyer is to watch the slides being opened and closed. Note if they operate smoothly or if they jiggle, grind or make excessive noise when in motion. Also take the time to carefully inspect the weather stripping (seals) around them. Seals should be soft and pliable. If they are hard and cracked…you probably want to look at having them replaced. This is a labor intensive job and in some cases requires the removal of the slide from the rig. Keep them treated with the proper seal treatment and lubricant recommended by the manufacturer. Don’t just assume that you can use silicone or something like Armour All. Some of these chemicals actually cause the decay process to speed up! If you can’t see the top of the slide, use a ladder or climb up on top of the rig. Take your flashlight, especially if there are slide toppers installed. Visually inspect the top seals and the slide for damage. You’d be surprised how much damage can be done when a branch, hard nut or other object can do when crushed as the slide is being closed. Out of sight typically means out of mind…if someone didn’t notice this happening…you probably better know about it before you purchase the rig and discover it for yourself. Same thing goes for the inside…check the floors where the slides move over when retracted. Any gouges, scratches or stains indicate something happened or the slide is having issues. Depending on the slide design, some have rollers that roll on the inside floor. Anything can and will find its way under those rollers…food, dirt and debris all can get wedged under the roller and cause damage to the roller and the floor. Note to self…be sure to vacuum and or wipe the area BEFORE closing the slides. And lastly for this segment…reservoir bottles, tanks and containers…if they are empty, there potentially is a problem. With age, plastic reservoir containers will dry out and crack…LEAK. Make sure they are holding fluids, that there are no holes or cracks which allows the precious fluids to leak out. These reservoirs are common with engine coolant, hydraulic fluids for transmission and leveling jacks, power steering and windshield washer fluids. It’s the little things that add up to be the most costly and frustrating later on, that too many tend to overlook to acquire their dream. Don’t let these go unnoticed and turn your happy dream into a nightmare.